A few books and several thousands of articles has been written about Sir Paul Edmund de Strzelecki (1797 – 1873). While the achievements of Strzelecki are in general known, his biography has not been precisely investigated. The most extensive and also the most discerning biography, Sir Paul Edmund de Strzelecki (Melbourne, 1997) was based on decades of research by Lech Paszkowski. Lech Paszkowski is also the author of Strzelecki’s biographies in Australian and Polish dictionaries and encyclopedias. The newest biography was published recently in „Polish Biography Dictionary, Volume XLIV ” - ( „Warsaw-Cracow 2006 - 2007” ) . Lech Paszkowski was chosen from fifty million of Poles to write this biography. Strzelecki's biography by Allan Andrews, published in the most prestigious biography dictionary „Dictionary of National Biography” was based on Lech Paszkowski's works. Lech Paszkowski is an uncontested authority on the Strzelecki subject and it will be not an exaggerated statement to say he is the most outstanding authority on the subject. The above statement has been introduced to demonstrate the great importance of Lech Paszkowski's article „Myths in Polish Biographies of Paul Edmund Strzelecki. 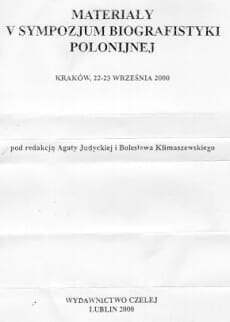 Materials of the V Symposium Polish Biography” Cracow (Jagiellonian University), 22-23 September 2000, edited by Agata Judycka and Boleslaw Klimaszewski (Czelej Publishers, Lublin 2000). It would be more appropraite to present the whole article, but as there are ten pages of print, I will attempt to present summary of the main thesis supported by comprehensive quotations. The first Polish biography titled „Paul Edmund Strzelecki: Travels - Discoveries - Works” (Warsaw, PWN 1957) was written by Waclaw Slabczynski (1904 - 1994). He based it, in principle, on his own investigations, but also, on a few Polish sources, mainly on the article „About Paul Edmund Strzelecki: According to Family and Company Recollections „ (Ateneum, Warsaw 1876)” by Narcyza Żmichowska (1810 - 1876) referring to the young years that the future explorer spent in Poland. As stated by Lech Paszkowski. „Selection of scraped together very inaccurate tales, in no respect of accuracy of dates and of written evidence”. „Abducting of Young Lady” and Memoirs of Adam Turno. In 1996 Lech Paszkowski finished writing his work on Strzelecki, in order to publish it on the two–hundredth anniversary of the Polish explorer’s birth. When Lech Paszkowski proposed search for Adam Turno’s memoirs, which could not be recovered by Waclaw Slabczynski, I asked whether I could be of any help. This task appeared not to be feasible, but turned out to be effortless. I applied to Dr Piotr Zubielik from Poznan (Posen) with the request, who in a short time found Turno’s diaries in the Ossolineum Library and dispatched me a copy. Thus The Book VII (from the First of May 1820 to the Seventeenth of May 1823) reached Lech Paszkowski, who spent …two months of laborious decoding of sometimes crossed off entries. Zmichowska communicated, that the enamored Pawel snatched Adyna Turno from her father’s mansion in Objezierze in year 1821. This is incorrect information, because Objezierze was inherited as a dowry after the brother of Adyna married Helena Kwilecka circa 1830, when Strzelecki surely was in France at that time. This abduction became a foundation of all tales about Strzelecki repeated in countless journalists’ variants. It should be clearly said, that the supposed snatching, depicted by Zmichowska is improbable. Adyna did not reside with her father, as stated by Zmichowska, but in Sendziny, 25km West of Pozen, with her maternal grandmother Prusimska, who supported and educated her from when she was six years old, estimating these expenses at 11 000 zl and also covering costs of a French governess Marie Dupain. Adam Turno commited Adyna for upbringing by his mother-in-law in year 1811 after divorcing his wife Urszula with the maiden name Prusimska. After this he permanently inhabited in the manor of his widowed sister-in-law in Dobrzyca, 85 km from Poznan, half way to Kalisz, in other words about 115 km by roads from his daughter. He visited her occasionally, sometimes after a few months. Strzelecki did not need to carry Adyna away, he had many opportunities to take her during Adam Turno’s absence, all the more so because Prusimska was well-disposed towards him and, possibly under the influence of talks with her granddaughter, she looked at him kindly. …Decoding of Turno’s notes in year 1996 did not resolve a number of doubts. The first picture of Strzelecki as seen by Adam Turno: a handsome, polite, well educated man but moneyless, meaning in this case, that he did not possess any estates, of which Turno dreamed for his daughter. … she confessed that she had a weakness for Str.. But what was the parental heart to do but to step aside and cry. Here is only a mention about the rumors that Adynka run away. … It is evident that Turno did not know anything about abducting of his daughter and was only worried about gossips. Evidently there was no abduction. There is no doubt that the word „adventurer” refers to some conflict between Strzelecki and Turno. There is a blank in the diaries between the end of August 1821 to July 1822, because Turno burned this part. It can only be determined here, that the acquaintance of Adam Turno with Strzelecki lasted for only 15 months, from the start of July 1820, to the end of September 1821. What happened during this time period we do not know. The words… „I wish him all the best” testify that after all Turno maintained some respect towards Strzelecki, which would not happen after an attempted kidnapping or abduction of his daughter. In a letter to Adyna dated the 1st August 1840, Strzelecki recollected, that after parting with her father, he went to Sedziny to farewell her grandmother, who gave him some proposals and persistently asked for something. It is hard to imagine that Prusimska aimed her proposals at the „abductor” of her beloved granddaughter. Most likely „Noodles and Milk in Objezierze” by Zmichowska is such a truthful fact as the „abducting” of 24 other lasses by Strzelecki (note her „According to Family and Company Recollections”, page 417). Interesting, where he could hide such a harem and that could get away with it. On the anniversary of 200 years of Strzelecki’s death, extensive articles about him appeared in Warsaw newspapers and in the Polish emigrant press in London and New York. It could be read there, besides reproduction of Zmichowska's gossip, improbable inventions as well. Firstly the authors of these articles did not have any conception about the nobleman’s sense of honor amongst the gentry of Wielkopolska at the beginning of the 19th century. Secondly it is hard to imagine, that always proud, strong, canny, resourceful and swift Strzelecki let himself to be battered like a ram. There were no such „revelations” by Zmichowska nor in the Helena Kutrzebianka’s article „The romantic history from before one hundred years”, Kuryer Literacko-Naukowy, from the 9th May 1938, which was referred to.